BRUSSELS, Belgium -- The European Union is gearing up to sign a landmark partnership agreement with Ukraine next month, hopeful that Kiev will let the jailed opposition leader Yulia Tymoshenko get medical treatment in Germany before then. 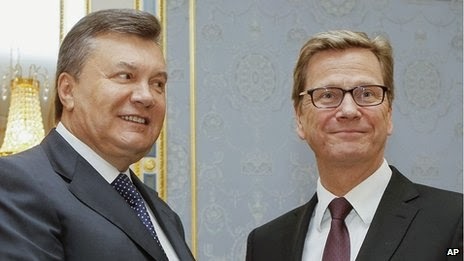 Germany's foreign minister (R) hoped to get Tymoshenko released in Kiev - but negotiations continue. When asked about such a move on Tuesday, the EU's Enlargement Commissioner, Stefan Fuele, said: "I think we are not far away from that... I definitely expect that to have happened before the Vilnius summit." At the summit in Lithuania's capital on 28-29 November the EU plans to strengthen ties with Ukraine and two other smaller ex-Soviet states - Georgia and Moldova. Ukraine, with a population of 45 million, would be the biggest prize. It was ruled by Moscow for centuries until 1991 and Russia still sees it as an integral part of its sphere of influence. But EU ministers and MEPs have expressed concern about human rights in Ukraine, urging improvements to its electoral and legal systems, as well as the release of Tymoshenko. She was jailed for seven years in 2011 for exceeding her powers when she agreed a gas deal with Russia. She is an arch-rival of Ukraine's President Viktor Yanukovych, Moscow's favourite who narrowly beat her in the 2010 presidential election. The EU has been pursuing closer economic and social ties with ex-Soviet states for many years, in a so-called "Eastern Partnership". The plan is to sign a far-reaching association and free trade agreement with Ukraine - seen as an important step towards eventual EU membership. Agreements would also be initialled with Georgia and Moldova. Kiev has responded with reforms and legislation, and a flurry of diplomacy is under way to seal the deal in time. "The allure of a relationship with the EU for some of these countries is a matter of concern for Russia, and legitimately so," says John Lough, associate fellow on the Russia programme at the Chatham House think tank. "The EU is a powerful symbol of Western values and institutions. Its neighbours' choices could fundamentally change the way the Eurasian region is structured and administered." Russia is putting pressure on ex-Soviet republics to join its own customs union instead. Moscow wants to create a Eurasian trading bloc that could eventually rival the EU, but without the commitment to democracy and openness demanded by Brussels. Kazakhstan and Belarus have already signed up. And last month Armenia signalled interest in joining the Russian-led bloc - surprising EU negotiators who were trying to forge closer ties with Yerevan. Russia appears suspicious about the EU's ambitions in former Soviet republics. Some countries previously ruled from Moscow have been hit by Russian import bans on certain products. Others have been subject to extra border inspections. Ukrainian sweets, Moldovan wine and Lithuanian cheese have all been subject to import bans in recent months. Russian officials cite quality and health concerns, but in Strasbourg last week MEPs accused Moscow of trying to intimidate East European states. The EU Trade Commissioner, Karel De Gucht, described Russia's actions as "inappropriate and discriminatory". The EU's foreign policy chief, Catherine Ashton, also raised concerns with Russian Foreign Minister Sergei Lavrov last month. "This behaviour is not in line with the principles that Russia had subscribed to," says her spokeswoman Maja Kocijancic. "Each country has a right to freely define and conduct its relations with other states in accordance with international law." On Monday a Russian foreign ministry spokesman, Alexander Lukashevich, played down the tensions, saying "the purpose of our actions is not to apply pressure on these countries, but to protect our own market". He stressed that "despite problems, there are many areas of co-operation" with the EU. Energy supplies are a key part of the equation. The Russian state gas monopoly Gazprom provides about a quarter of the EU's natural gas. Moscow has pointedly reminded East European countries of their heavy reliance on Russian gas. In Moldova last month, Russian Deputy Prime Minister Dmitry Rogozin reportedly said "energy supplies are important in the run-up to winter - I hope you won't freeze". The EU Competition Commissioner, Joaquin Almunia, is considering taking formal action against Gazprom for alleged market-rigging. "We suspect that Gazprom has been hindering the free flow of gas across member states… and imposed unfair prices on its customers," he said recently, after a lengthy European investigation. Under European anti-trust laws, Gazprom could be fined a proportion of its profits worth several billion dollars. "This is straight out of the classic Russian toolkit for dealing with neighbours," says John Lough. "Moscow hopes the threats and blackmail will force these countries to stay in its embrace. But as far as the Ukrainians are concerned, it's only stiffened their resolve to do a deal with Brussels." Commissioner Fuele's spokesman Peter Stano insists that "there is no Plan B" for the Vilnius summit. "There's no reason for Russia to fear more European democratic standards, free trade and economic modernisation. These agreements are not a geopolitical game for us, and they are not conceived at Russia's expense. "On the contrary, Russia will also benefit greatly from the integration of the Eastern Partnership countries into the wider European economy," Mr Stano said.